The kitchen is more often than not, the heart of the home. With trends constantly changing it’s hard to keep up with what’s “in” and what’s “out”. 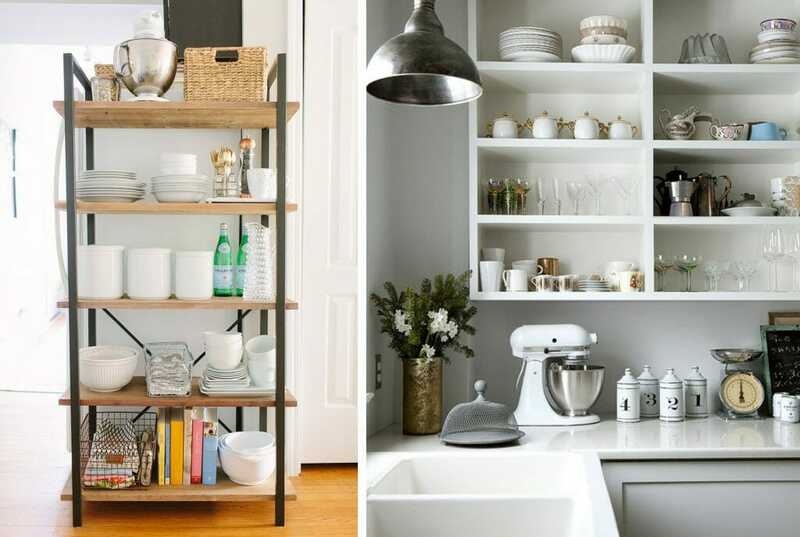 Well, we are here to tell you, an open shelving kitchen is not going anywhere any time soon. 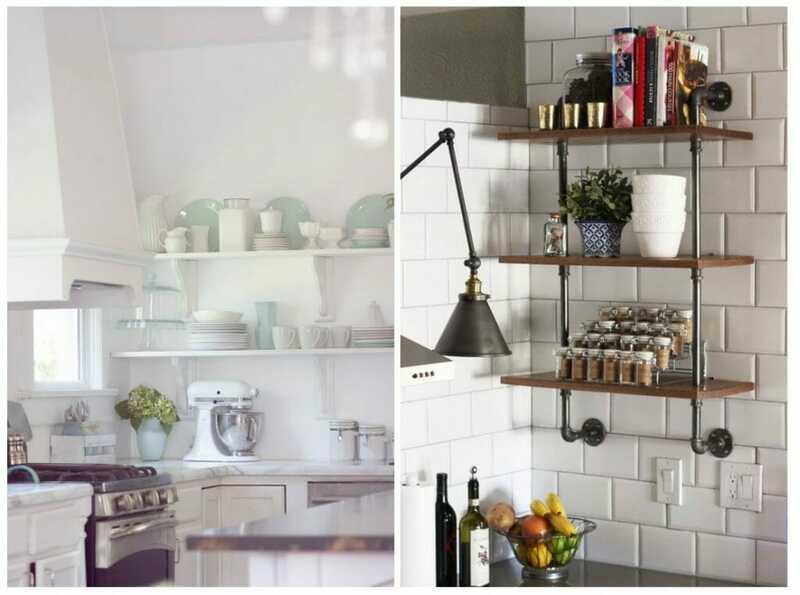 Open shelving is definitely one of the best ways to update your kitchen without a ton of effort. It opens the space, creating a neat and actual look and it works with all styles. There are many ways to achieve it; some require more works while others can be implemented in little more than an hour. So, whether you want to revamp your existing kitchen or remodel it from scratch, an open shelving kitchen can be a good option for you. 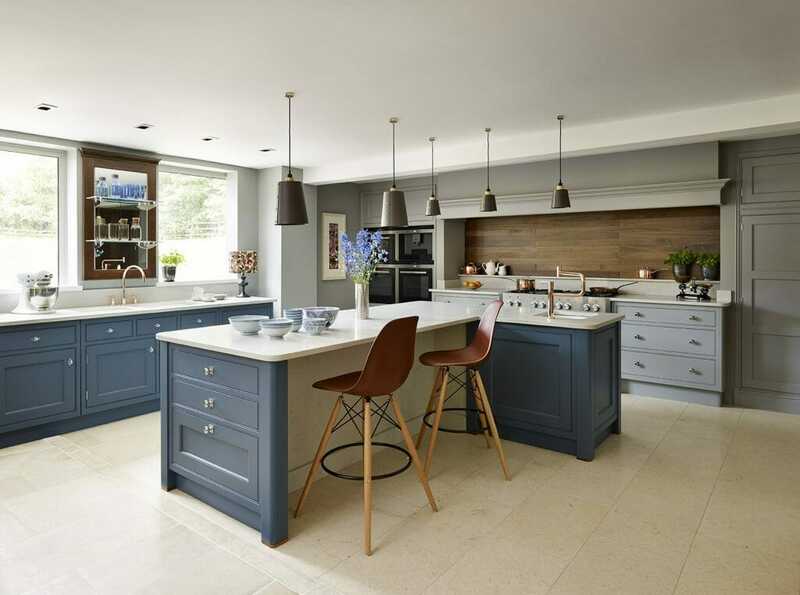 For even more inspiration on kitchen design, read through our top 5 kitchen design tips. And for the best strategies to incorporate open shelving successfully, just keep reading! 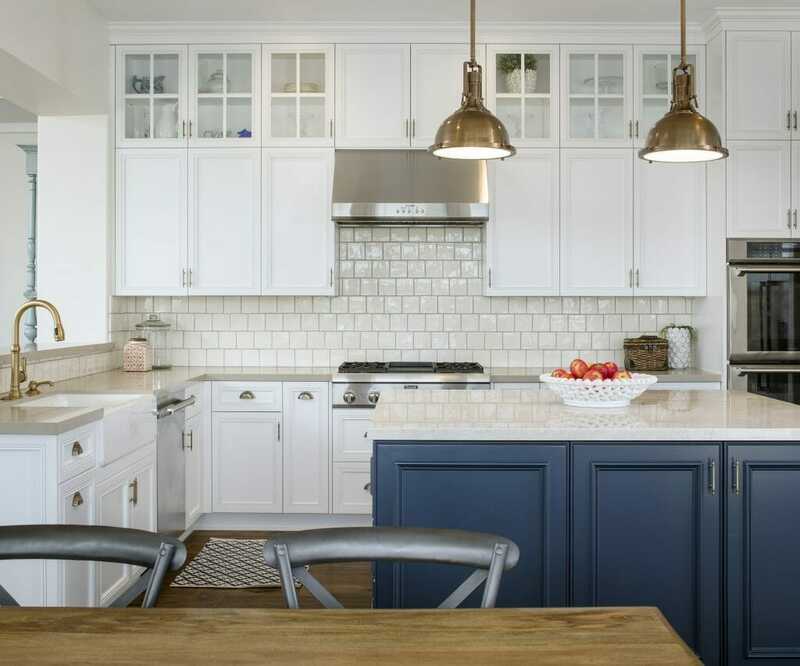 Design by Decorilla online interior designer, Mary L.
The number one concern that gets raised when talking about an open shelving kitchen is that it’s unpractical, it clutters the space and accumulates dust. 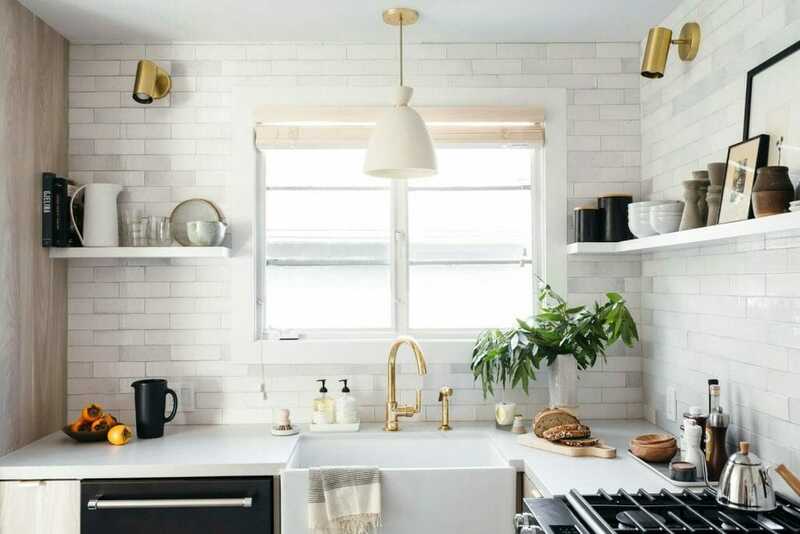 To avoid stuffing your shelves with tons of dishes (which is indeed both unpractical and cluttering), consider having a combination of both open and closed shelving in your kitchen. This will also allow you to hide the not-so-pretty items and display just those that are worth showing. To minimize the dust issue, the best strategy is to display mostly items you use often. This way you will have them easily accessible and your open shelving display will stay free of dust. Design by Decorilla online interior designer, Nathalie A. 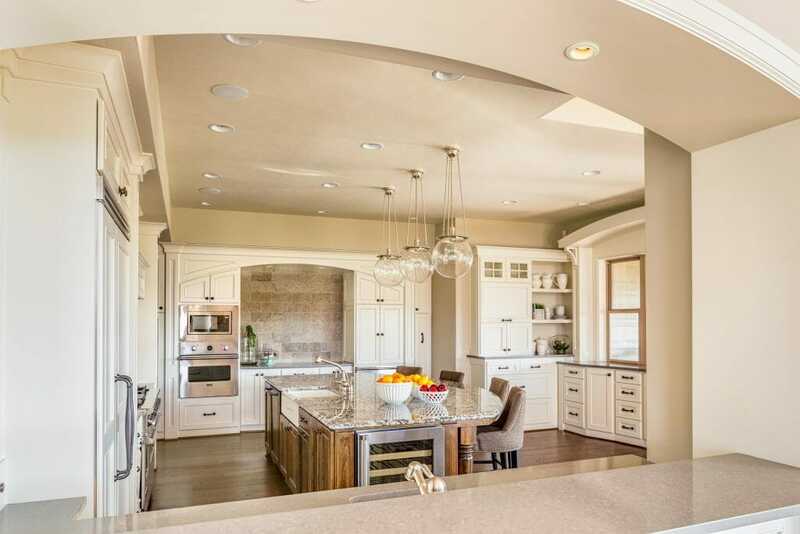 Open shelving is a great option for open floor plan kitchens. It makes the space feel airy and can help with your color scheme too! Besides being functional, the dishes you display are the ideal accessory to incorporate your accent color. If you prefer neutral tableware instead, opt for shelves that recall the colors and style of your living space. Design by Decorilla online interior designer, Francis D.
The beauty of open shelving is that it leaves a clear view of the wall behind it. Such a great occasion to have fun with your wall treatment! Eye-catching tiles, a vibrant wallpaper, bold paint…these are just some ways to make the wall behind your open shelving the real focal point of the room! And if you want to highlight it even more, go for glass shelves. Your dishes will appear to levitate in the air and the attention will be all on your gorgeous wall feature! 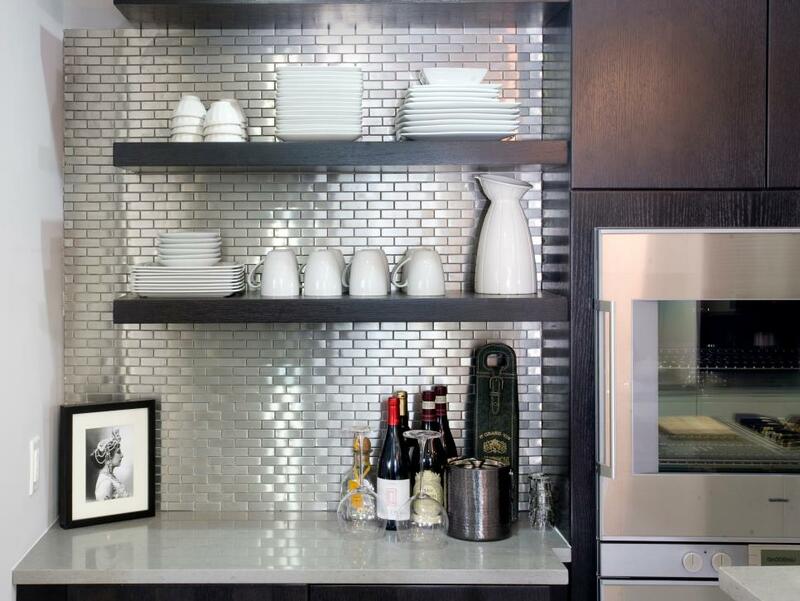 Extra – If you have space issues, an amazing option is to have a mirror wall installed behind your open shelving. It will make wonders in making your space feel so much bigger! Design by Decorilla online interior designer, Aldrin C.
When open shelving is used in an open floor plan kitchen, it can happen that the shelves fall just in between the kitchen and living areas. A problem? Not with the right accessorizing tips! 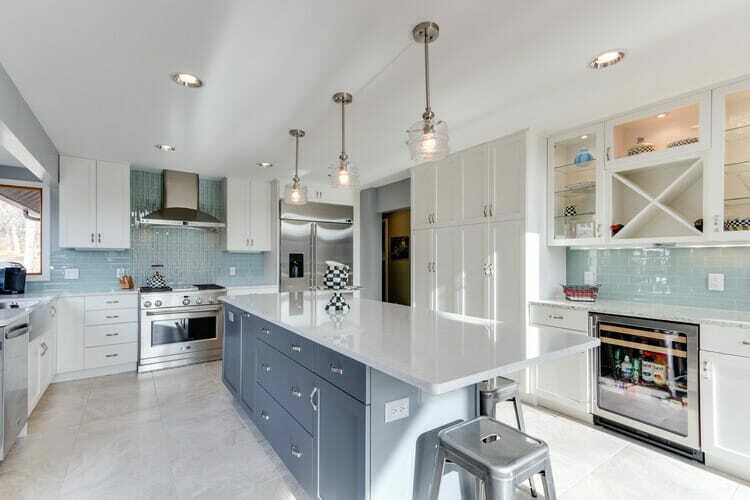 The best styling in this case is a mix of kitchen and living items. Few dishes combined with decorative pieces, plants, books or picture frames will help the space feel integrated and cohesive. And your open shelving will become a feature! 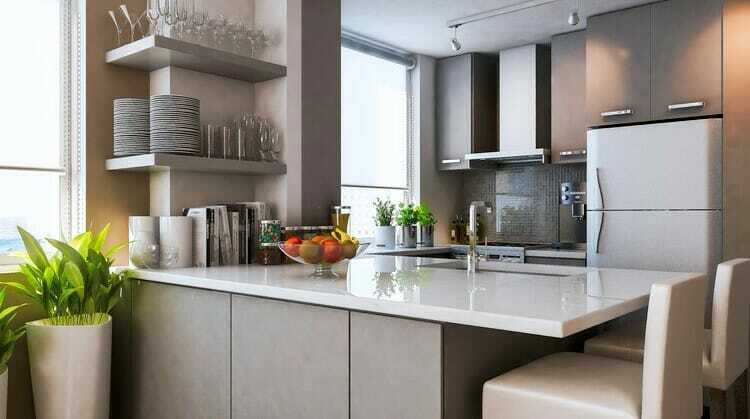 What if you want to go for open shelving in your kitchen, but you cannot make big changes to the existing space? No worries! Opt for free-standing shelving units. You will get the open shelving look while adding a fresh and unexpected feature to your kitchen! And if even this is too much, just take off the doors of your existing cabinets! This last is also a good tip if you’re unsure and you want to try the open shelving concept before you implement it. One final tip: if you love the look of open shelving, but you’re still not convinced it’s the right choice for you, here’s a little trick. Take off your cabinet doors and…substitute them with glass doors! 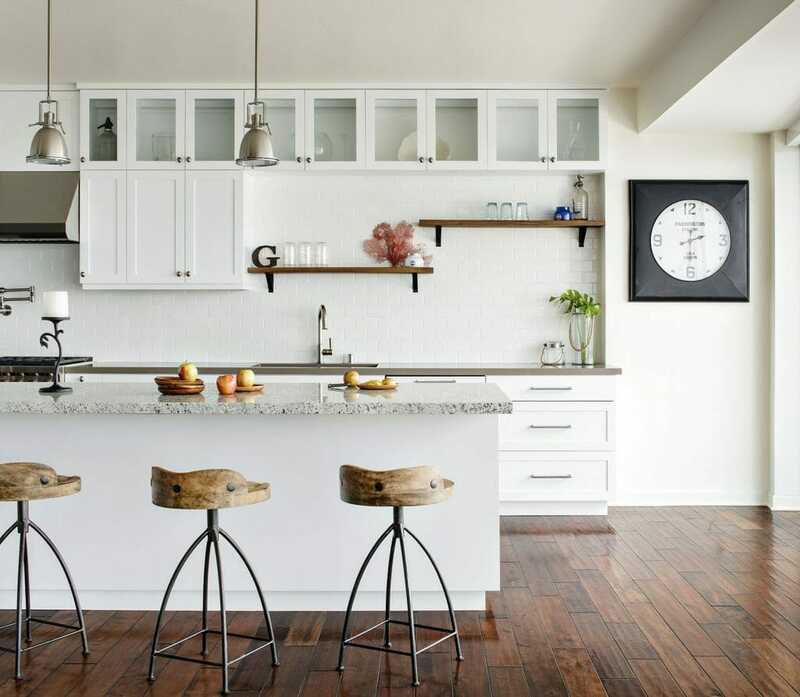 Design by Decorilla online interior designer, Audrey P.
And voilà, 5 top strategies to make your kitchen beautiful and functional with open shelving! 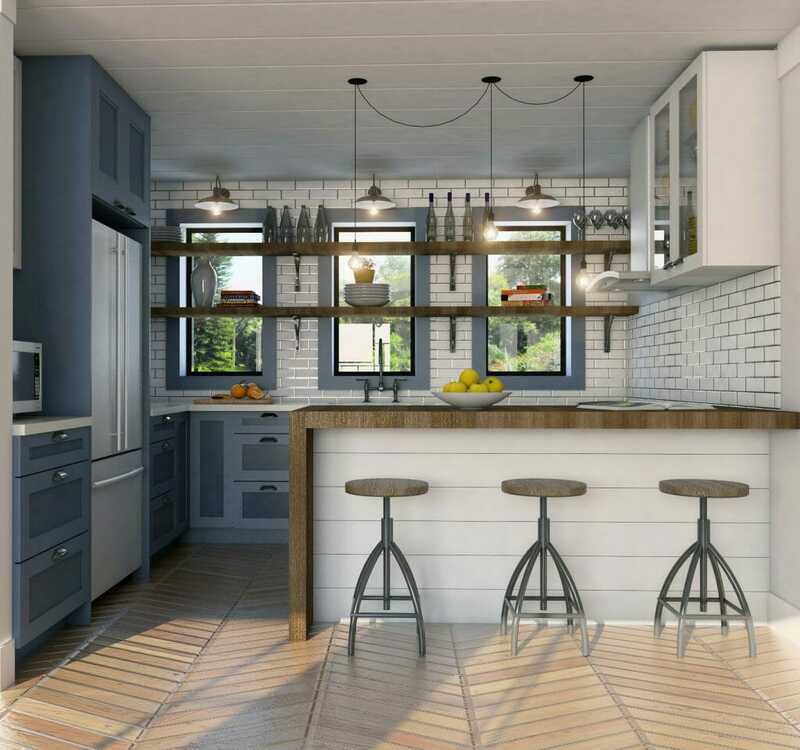 To make your space even more actual, take a look at the new kitchen trends for the upcoming future. 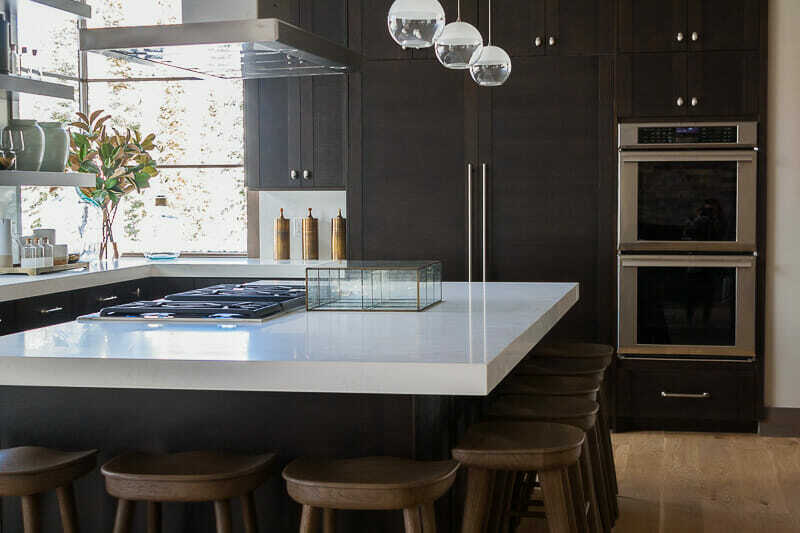 And if you need help to make the kitchen you have in mind come to life, connect with one of Decorilla’s talented online interior designers to Schedule a Free Consultation and finally achieve the kitchen of your dreams! Written by Decorilla interior designer, Silvia C.